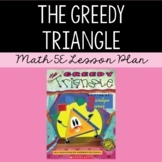 Geometry Activity: "The Greedy Triangle"
The Greedy Triangle - Geometry Fun! The Greedy Triangle: An Animated Powerpoint for Instructional Use! "The Greedy Triangle" Bulletin Board / Follow up Activity! The Greedy Triangle - How Many Degrees Do You Have? 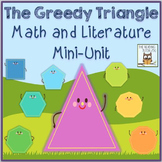 After reading the Greedy Triangle, students can create their own Greedy Triangle booklets! The Greedy Triangle takes the reader to fast change of pace. He changes throughout the book. Students will be seeing the difference with the triangle from beginning to end. Learning about Geometry... Listen to the story The Greedy Triangle by Marilyn Burns and complete this activity. It is a great way to introduce polygons to your students. It is interactive, creative, and enjoyable. You can use it on your bulletin board to showcase their work/learning afterwards. An activity to supplement "The Greedy Triangle" by Marilyn Burns. A polygon and solid object hunt for your classroom. If you need any edits, please feel free to email me, and I will do my best to make this sheet suit your needs! Happy teaching! This is a follow up activity that your students can create after listening or reading The Greedy Triangle by Marilyn Burns.